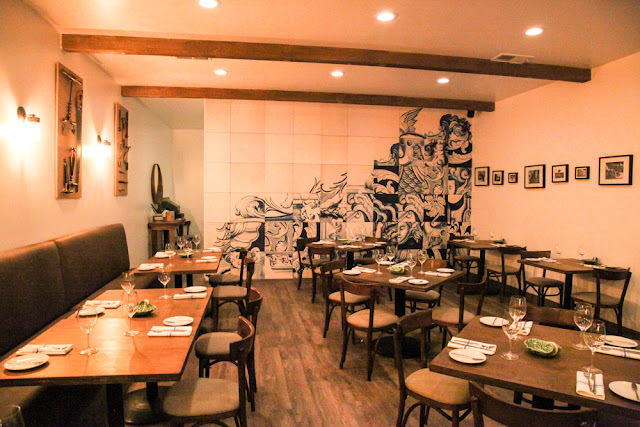 I was initially heartbroken when Sousa's, the only Portuguese sit-down restaurant in Silicon Valley, closed earlier this year after a 33-year run. Ordering Sousa's for special occasions was a family tradition of ours. 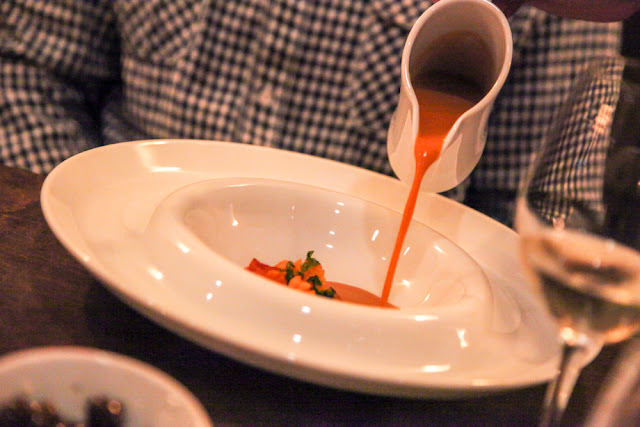 However, it is time for a new generation of chefs to carry the torch and bring their own unique spin to Portuguese cuisine. The restaurant was sold to husband-and-wife chef team David Costa and Jessica Carreira along with Carlos and Fernanda Carreira (Jessica's parents). Jessica was born and raised in San Jose. She studied cooking at the Cordon Bleu and then went to Portugal for three years to master Portuguese cuisine. By age 20 she became the head pastry chef at Restaurant Eleven, a Michelin-star restaurant in Lisbon. That is also where she met her husband David Costa. David had been cooking for over ten years and believes in transforming traditional dishes without destroying the original flavor. He has worked at several notable restaurants in addition to Restaurant Eleven and was the sous-chef at the Four Seasons Hotel in Lisbon. With Adega (which means wine cellar), David and Jessica have realized their life-dream of opening their own Portuguese restaurant. There is character in every corner of the space. 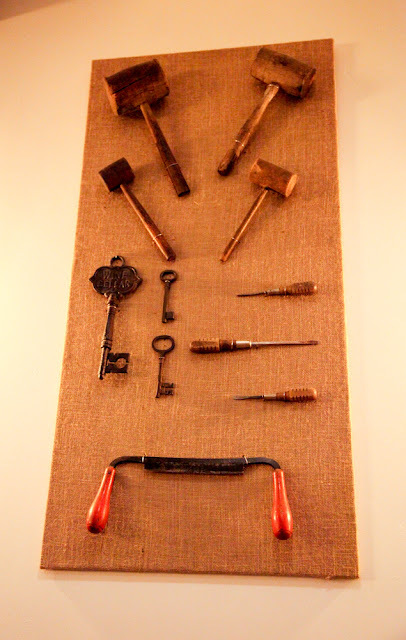 Much of the furniture is hand made, original tools used in wine-making are hanging on the walls, there is a traditional tile mosaic on the back wall, even the plates and dishware are imported from Portugal. True to the restaurant's name, Adega's massive collection of Portuguese wines is one of the first things you'll notice when walking in. It is immediately clear that this is not a cookie-cutter restaurant. Before I get to the food, let me just say I am Portuguese-American and have been eating amazing home-cooked Portuguese meals for 35 years. I've visited Portugal over 20 times and have had countless amazing, authentic meals there. The dinner I had at Adega in San Jose, was easily one of the top five Portuguese meals I have ever had in my life. I think the food here is something that everyone can appreciate, even if you have never had a Portuguese dish before. 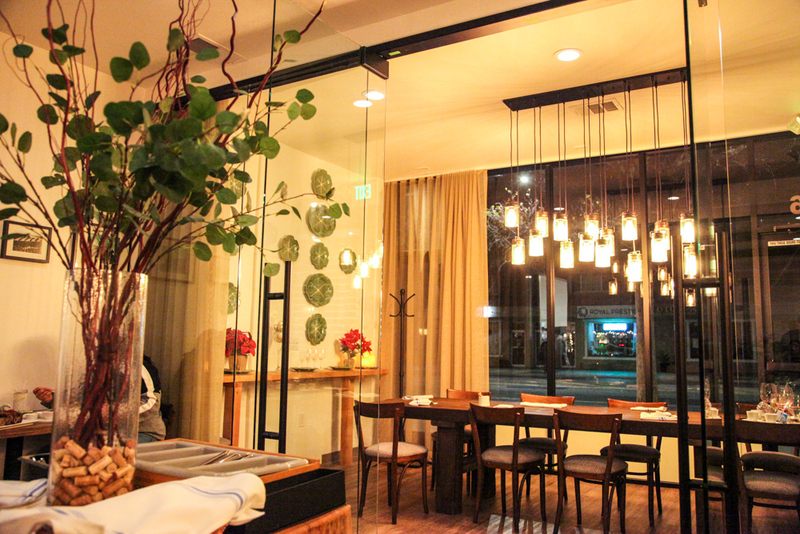 This could very well be the best fine-dining restaurant in San Jose right now. House-made hummus and Portuguese bread - These comes complimentary. The hummus is a unique blend and may change from one visit to the next. 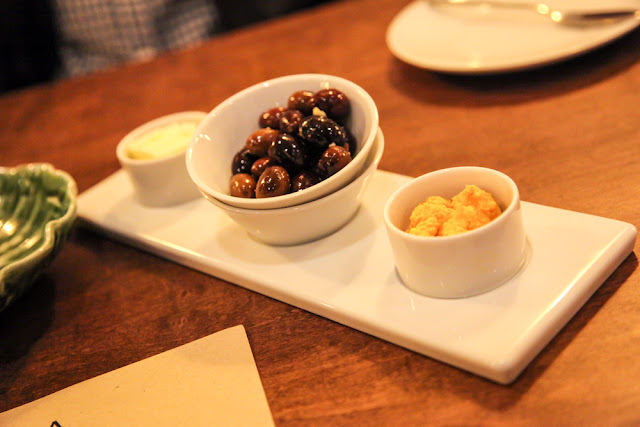 The marinated olives are perfect to nibble on while you browsing the menu and wine list. Pork belly, pea puree, poached quail egg - A must-order dish! 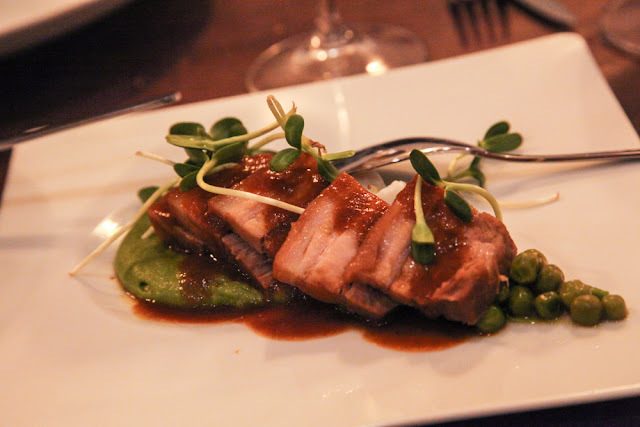 Pork belly has become very popular in the US over the last few years. This combines perfectly cooked slices of pork with an outstanding pea puree that could stand on its own. Add the quail egg and you have magic on a plate. The presentation is also gorgeous. Sweet prawns in a buttery garlic sauce - This is a very simple dish that is exploding with flavor. I forgot to ask how long the prawns are marinaded for, but I imagine it is a very long time. 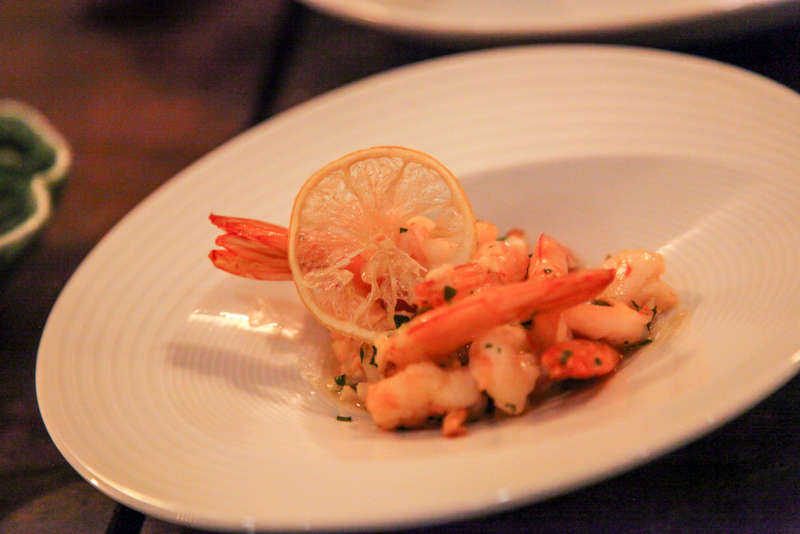 These were so good that we were looking around the table to see other's reactions when they bit into the shrimp. 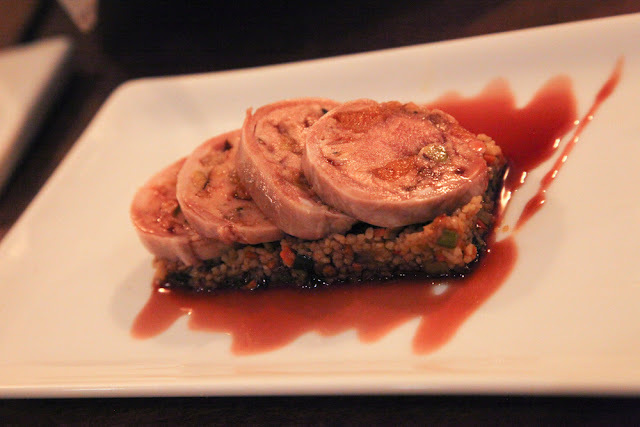 Rabbit terrine with pine nuts, pistachios and cous-cous salad - Rabbit is not something you see often on American tables, but it is a popular staple of Portuguese cooking. The taste is similar to chicken and is not gamey at all like other "exotic" meats. 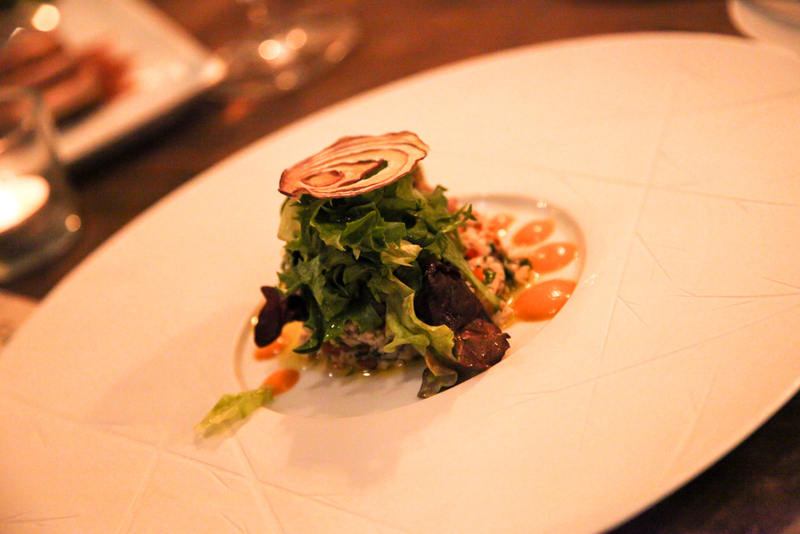 At Adega, it is prepared perfectly in a terrine mixed with nuts and each slice sits on a bed of cous-cous. The sweet sauce on the bottom is what really elevated the whole dish for me and made it all come together. If you are adventurous, you have to try this one. Octopus salad with roasted red pepper sauce - As beautiful as this dish was, I could only try a small bite since I'm allergic to raw onion. Everyone else at the table had no problem cleaning this plate. Fresh cut kale, chourico bits, cream of potato (Caldo Verde) - This is as traditional of a Portuguese soup as you can get. It tastes just as good as how my grandmother made it, but Adega dresses up the soup with a modern presentation I have never seen before. It tastes as good as it looks. 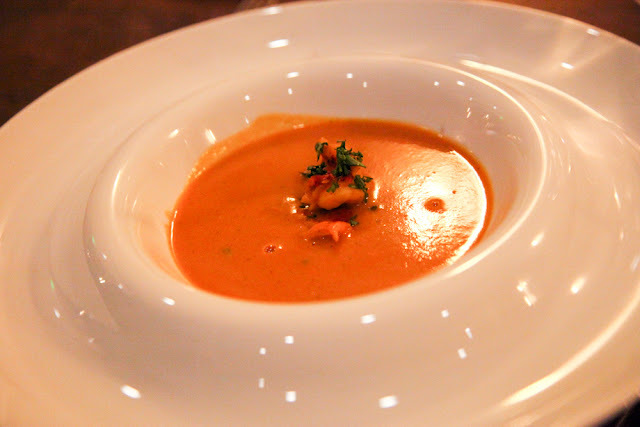 Seafood bisque, aspic of lobster & oysters - Absolutely delicious. This is as good as any soup I have ever ordered at a Michelin-star restaurant. The soup is poured over the seafood table-side. 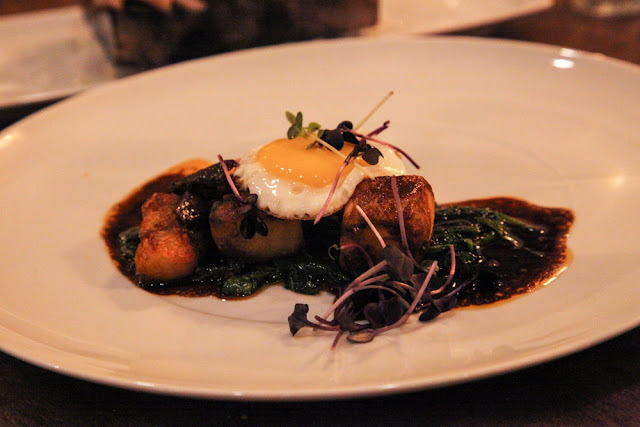 Ribeye steak, crispy Iberico ham, fried egg, fried potatoes (Bife a Portuguesa) - Wow, what an amazing and fun interpretation of a Portuguese classic. Usually this is a marinated flat-iron steak topped with an egg and french fries, but Adega has put a tuxedo on this traditional dish. 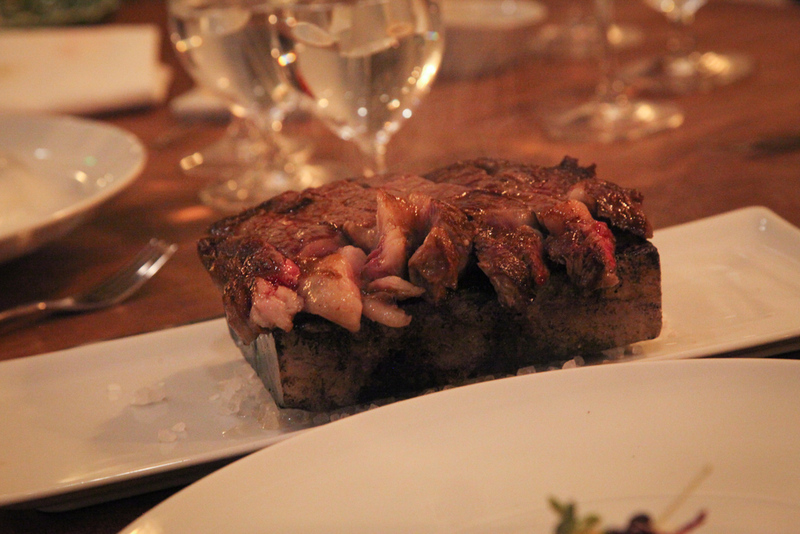 They use a premium Ribeye which comes medium-rare and sizzling on a hot stone (similar to Rok Bistro). You can leave it on the stone to cook to your favorite temperature and then combine it the accompaniments on the neighboring plate. 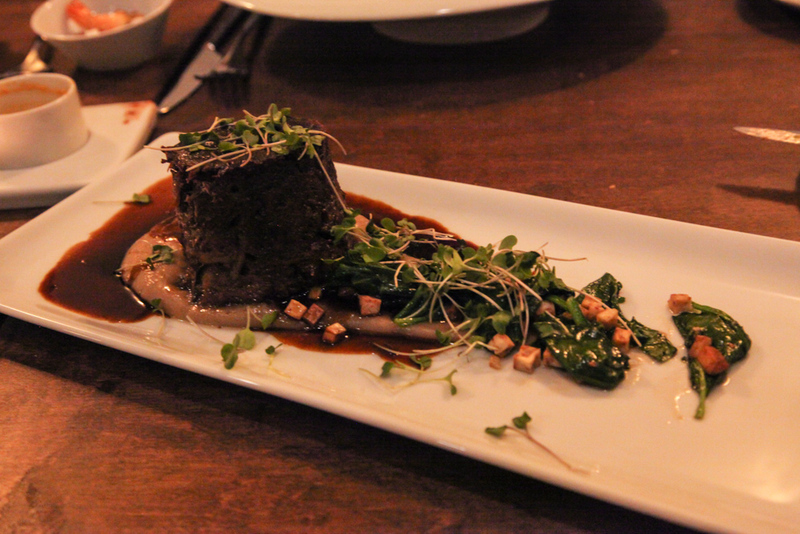 Braised beef, roasted taro root puree, sauteed spinach (Alcatra e Inhame) - Another outstanding beef plate. This one is less interactive than the Bife a Portuguesa, but combines melt-in-your-mouth beef with taro mashed potatoes and surprisingly flavorful spinach. This was one of my wife's favorites. 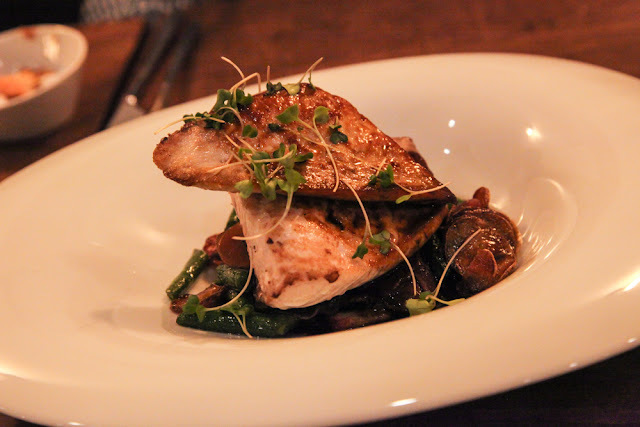 Sea bass cooked with potatoes, bacon, green beans - The fish was flaky, crispy, and moist all at the same time. The texture was excellent and it had the right amount of spices. Fried coconut rice pudding, passion fruit sauce, mojito sorbet (Arroz Doce Adega) - This might be the best Portuguese dessert I have ever had. It was not a traditional rice pudding like what I was expecting. 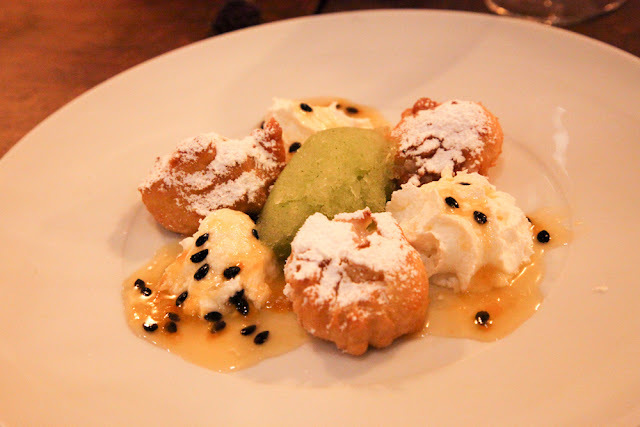 You have three fried pastries filled with coconut rice and combine those with the passion fruit sauce and mojito sorbet in the middle. I could have eaten a half-dozen of these. This is another must-order item. 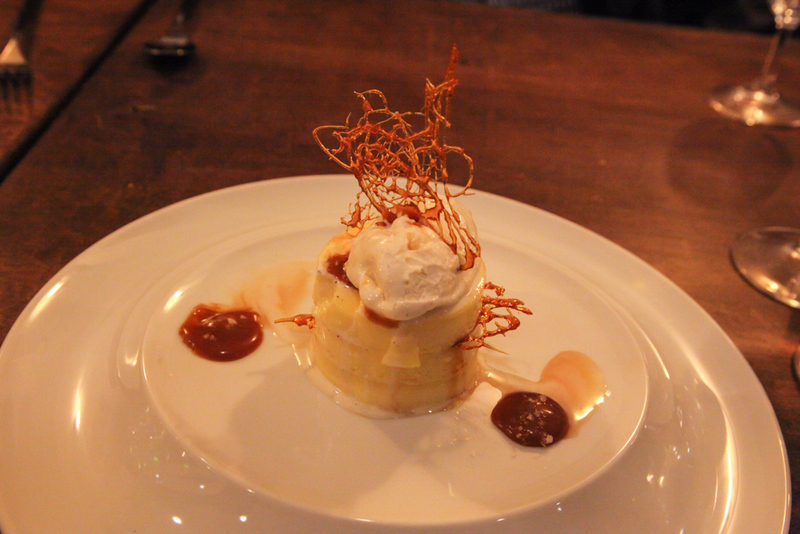 Flan pudding, caramel tile, caramel sauce, vanilla ice cream - This is definitely not your traditional flan. I like this version much more and my table devoured the flan in about 20 seconds. 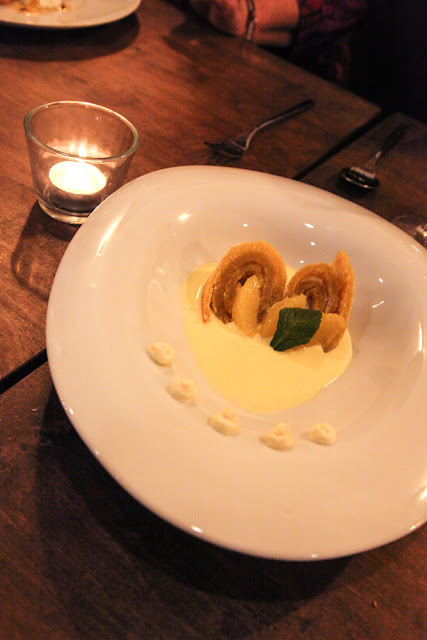 Orange roulade cake, cream cheese, in cardamom sauce - I don't think I have ever had this before in Portuguese cooking so I have nothing to compare this to. It was sweet, decadent, and the cake was the perfect sponge for the sauces and cream cheese. 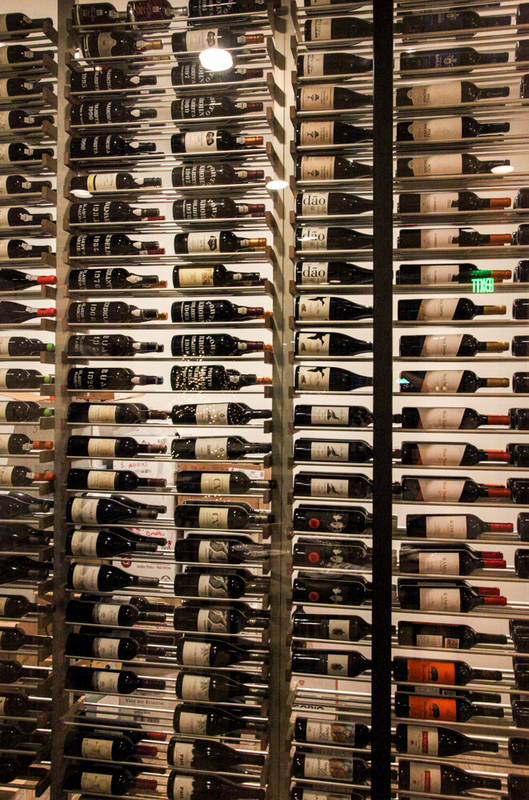 Adega has what is likely the largest collection of Portuguese wines of any restaurant outside of Portugal. Chef Jessica's parents are both in the wine industry and have used their connections to get over 200 different types of wine across multiple regions of Portugal. You will probably need some help picking a wine similar to what you are used to, but I would recommend being adventurous and trying something that you will never find anywhere else. 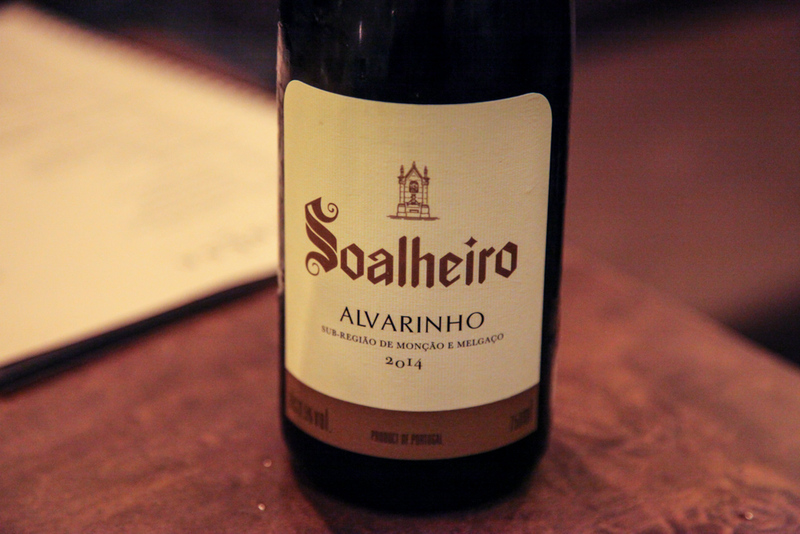 My pick would be a "Green Wine" (Vinho Verde), which comes from one of two varietals exclusive to Portugal. The cost for these is very inexpensive and Adega has some of the best ever made. For dessert, you can add a shot of Port, Madeira, or Moscatel to help close out a wonderful meal. They have suggested pairings for each dessert and the cost is only $5. Adega also has a selection of Portuguese beers and sodas. If you are going non-alcoholic then I recommend the passion fruit soda. In conclusion, you should book a reservation ASAP before the word gets out. Adega is San Jose's best shot at getting its first Michelin Star Restaurant in 2017 and is a shining example of what the next generation of San Jose restaurants could be. 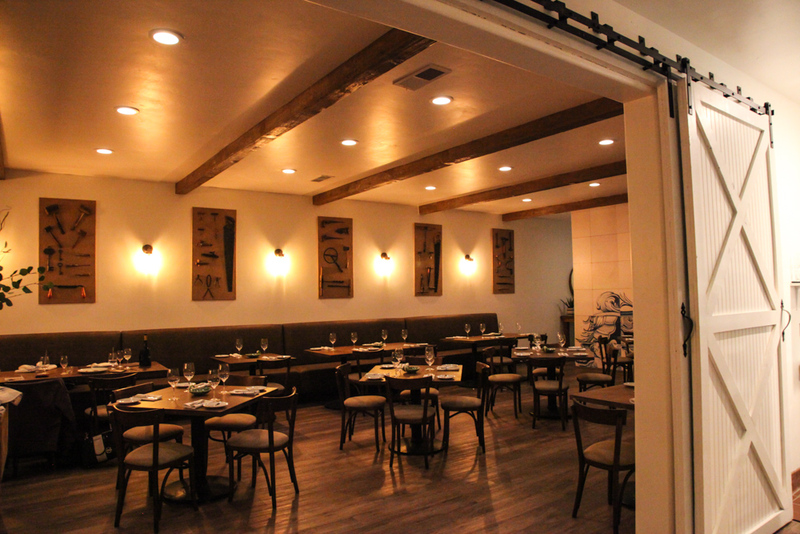 Adega is open for both lunch and dinner at 1614 Alum Rock Avenue. Hours are 11:30am to 2:30pm and 6pm to 10pm Wednesday through Sunday. Parking is available behind the restaurant, across the street, and valet parking is available on weekends. You can book a table from the Adega Website. Great review! Don't have much experience eating Portuguese food but am looking forward to trying it out. I look forward to trying this new restaurant as well. 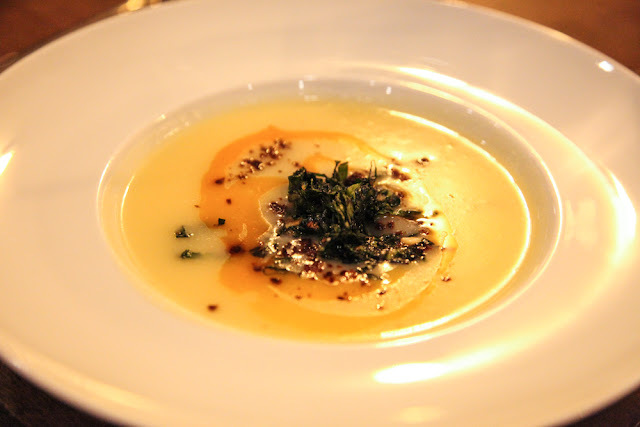 I ate at Sousa's several times and have taken coworkers with me there, and all of us loved it. We rarely have a chance to to go there though as it is quite out of Downtown where I work. But I'll make sure to make it more than just a lunch spot. I went there opening day, and my whole experience was borderline flawless. There is an immense potential for that spot, as long as it can get the right people to drift out of city center and into whats left of Little Portugal. To be honest, I hope it causes some of the other places there to step up their game. It's truly a gem in all facets. I have been there and it is simply amazing. Congratulations and I wish them a lot of success.